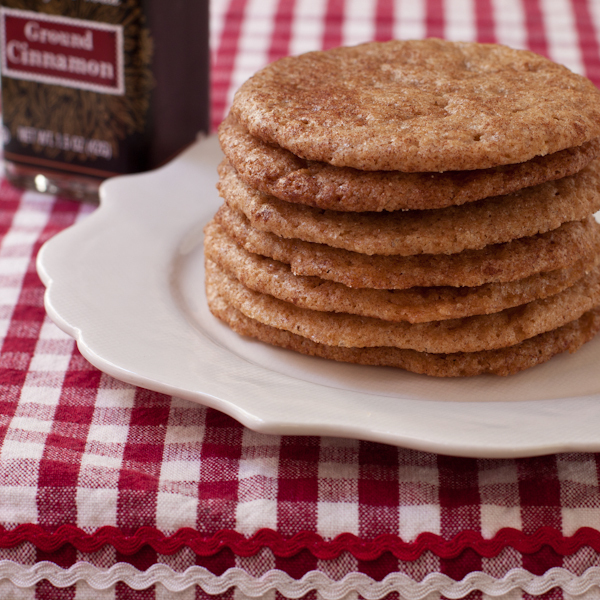 These crisp cinnamon-sugar cookies are a holiday classic. Crisp on the outside with a slightly chewy interior. This recipe is from my e-book Twelve Terrific Christmas Cookies: Gluten-free and Vegan. Now on sale for the holidays! I made these for the first time last year when I was developing my Christmas cookie e-book. Somehow, in all my years of cookie making, I had never made snickerdoodles! My friend Caroline always made them, and I do love cinnamon and sugar. Sometimes the simplest combinations are the best. Use Vietnamese (Saigon) cinnamon if you can; the flavor is out of this world. Add water to flax seeds and let sit 10 minutes to gel. Using a stand or hand mixer, cream butter, raw sugar and flax gel thoroughly in a large bowl until smooth and fluffy. Whisk flours, cinnamon, cream of tartar, baking soda, psyllium husk powder, and salt in a separate bowl. Chill dough for at least 30 minutes. Dough should hold together but still be fairly soft. Chill your ungreased cookie sheets for about 10-15 minutes in the fridge. Mix the last 3 T. of sugar and 1 t. cinnamon in a shallow bowl until one color. Scoop level tablespoonfuls of dough and drop into the sugar/ cinnamon mixture. Roll or cover with the sugar, then place onto the chilled cookie sheets. Flatten with the palm of your hand coated in sugar mixture. Let cool just five minutes, then carefully remove from pan using thin metal spatula and transfer to wire racks to cool completely. Store in sealed containers. These freeze beautifully. These look like the perfect gf holiday cookies! I’m vegan and my daughter must eat GF but also has migraines. It looks like the perfect recipe for both of us to enjoy but what would cause the recipe to not be suitable for migraine diets? Because sugar is inflammatory, it’s not recommended as a regular part of a migraine-friendly diet. So if a recipe includes sugar on my site, I don’t tag it as migraine-friendly. That said, there are no known migraine triggers in this recipe, so you and your daughter can enjoy these cookies together. Just FYI, step 9 is probably directions on spooning the dough onto the chilled cookie sheets. Baby typo, but important info nonetheless! Great recipe! Oh a favorite of mine. Snickerdoodles were the very first cookies I baked as a kid, for my 4-H group. I’d really like to make these! Could I sub buckwheat flour or another GF Flour for the oat flour? I cannot tolerate oats. Hi Beth, I would use quinoa flour (preferred) or garbanzo bean flour to sub for the oats. Good luck. 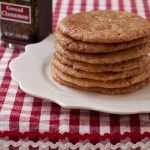 I LOVE snickerdoodles – I am interested in this recipe, I may try it later today!